Getting to North Lake Tahoe is easy with three international airports providing easy access and convenient flights. 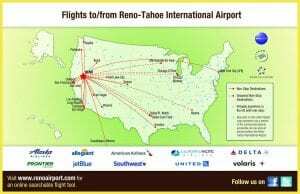 Reno-Tahoe International offers 9 airlines, servicing 23 non -stop destinations. To look for a flight from your home town airport, click on this useful Interactive flight mapping tool for flight options. San Francisco and Sacramento airports offer full schedules of direct and nonstop flights on most major airlines. The fastest air option is the Truckee-Tahoe Airport and welcomes private pilots and charter services such as GaryAir, AirTahoe and SurfAir. Kick it up a notch! Get ready for summer with this 6-week results driven fitness and weight loss program. Boot Camp is designed to help you reach your goals in a safe and supportive atmosphere.